Background: Candida albicans belongs to the most common fungal pathogens in humans, but recently an increased proliferation of strains called non-albicans Candida has been reported. Species belonging to this group are often characterised by a reduced susceptibility to antifungal agents. Objective: In view of the emergence of non-albicans Candida and their resistance to available antifungals, an attempt has been made to develop novel effective agents. Biological activities of the N,N-dialkyl diosgenyl glycosides, which were previously synthesized, were determined. Method: Minimum inhibitory concentration (MIC) was determined for group of clinical nonalbicans Candida isolates by serial dilution method in Sabouraud liquid medium. In order to assess the toxicity towards human cells the minimum haemolytic concentration (MHC) was determined on human erythrocytes by serial dilution method in phosphoric buffer. Results: The saponins exhibited a strong activity towards clinical isolates of C. glabrata and C. parapsilosis comparable or even stronger than that of conventional antimicrobials. A high rate of resistance to fluconazole was shown among C. glabrata isolates. Among clinical strains of C. krusei and C. tropicalis, isolates with a decreased susceptibility to saponins were identified. All the tested C. krusei isolates showed resistance to fluconazole, while among C. tropicalis numerous strains were resistant to all tested azoles. 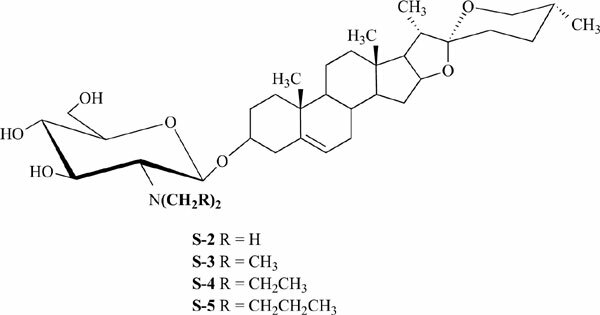 The saponins did not show haemolytic activities at their microbiologically active concentrations. Conclusion: Results of the present work encourage to continue the study on steroidal saponins and their potential application for the treatment of candidemia. Non-albicans Candida, fungal resistance, steroidal saponins, diosgenyl glycosides, fluconazole, amphotericin B.